The arrival of the railroads and the discovery of natural gas in the area resulted in the annexation of what is now the north portion of the neighborhood in 1875. The remaining portion of the neighborhood was annexed by the city in 1905. South-Central began as a community for Muncie’s manufacturing & industrial workers. The neighborhood is 220 acres in size and is located just south of the city’s downtown. It is bounded by E. Willard St. on the north, Memorial Drive on the south, S. Hoyt Ave. on the west, and S. Madison St. on the east. South-Central meets on the 4th Tuesday of the Month at 7:00 pm at Bridges Community Services, 318 W. 8th St. All are welcome! 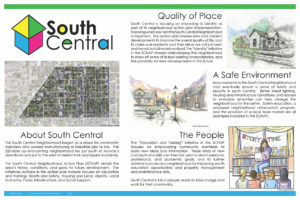 In the fall of 2012, Ball State University students studying in the College of Architecture and Urban Planning worked under the direction of BSU faculty member Lisa Dunaway and alongside neighborhood residents to create the South Central Neighborhood Action Plan (SCNAP). 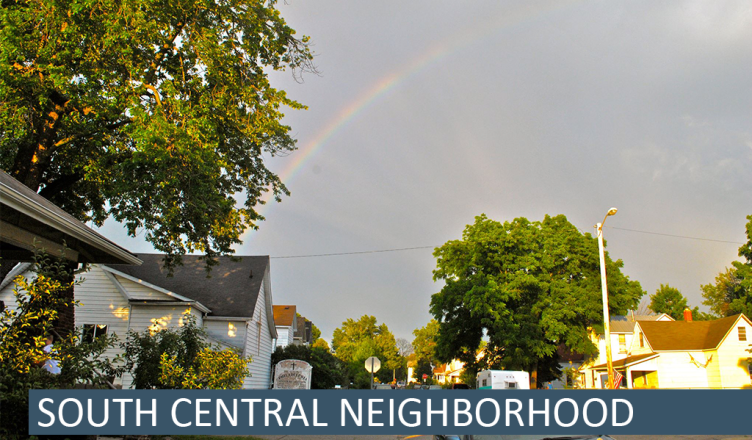 The SCNAP identifies seven separate initiatives that will help improve and enhance the neighborhood.